After ten long levels of No-Limit Hold'em action, Day 3 of Event: 41: $3,000 No-Limit Hold'em has come to an end with just two players remaining - Greg Ostrander and Jackie Glazier. Both players had the option to play an additional level to try and finish, however, both agreed to bag and tag and come back tomorrow. Glazier will come in as chip leader with 9,480,000, while Ostrander will come in with 3,070,000. Day 3 began with 30 hopefuls, including several well-known pros and our Day 2 chip leader Joseph Chaplin. However, half of field was sent to the rail within three levels, including Shannon Shorr (30th), Dan Shak (28th), Scott Montgomery (17th), and Jason Koon (14th). It took two-and-a-half levels for the first player to bust, but when he finally did, it would be JP Kelly after running his all in preflop into the of Hortin and failing to improve. Out in ninth place was Hortin, who was sent to the rail after his fell to Vas Nunes' when Nunes caught a pair of queens on the river for the knockout. Next to go was Frey, who also fell victim to a Vas Nunes suckout when Frey's was bested by Vas Nunes' after Vas Nunes caught a flush on the turn. Our Day 2 chip leader, Joseph Chaplin, would fall next when he found himself in an three-way all in holding the . Ronconi would scoop the pot when he turned the holding the and Chaplin was eliminated. Ronconi found himself out in sixth place after getting all in after a series of preflop raises with the against Ostrander's . The board bricked out for Ronconi and he was eliminated. Fontes went out next after finding himself short-stacked and pushing all in over the top of a Glazier raise with pocket deuces. Glazier called with and the board counterfeited Fontes' pocket twos - eliminating him in fifth place. Mortensen was sent home in fourth after Vas Nunes scored yet another suckout when his spiked a pair of treys on the river after Mortensen got all in against him with . Our final elimination of the night occurred after Paul Vas Nunes got into a preflop raising war with Glazier. Vas Nunes called an all-in shove of Glazier and his was bested by Glazier's after she turned an unbeatable flush for the knockout. Will Glazier become the first woman to win an open World Series of Poker Event since Vanessa Selbst, who took down a $1,500 Pot Limit Omaha event back in 2008? 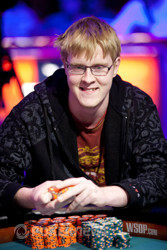 Or will Ostrander come from behind and claim his first WSOP gold bracelet? Play is set to resume tomorrow at 1:00 PM PST, where Glazier and Ostrander will play to a winner no matter what. Stay tuned right here at PokerNews to find out who will claim victory and the $742,020 prize that goes along with it! Until then, goodnight from Vegas! Our final two combatants have had a change of heart. They both agreed to bag and tag for the night and resume play tomorrow at 1:00 PM PST. We have reached the end of our scheduled ten levels of play, however, our two remaining players have agreed to play for one more level in an attempt to end this thing. They are both on a quick five-minute break. Jackie Glazier called from the button and Greg Ostrander raised to 305,000 from the big blind. Glazier went back over the top for 880,000 and Ostrander mucked - slipping down to 3,050,000. Jackie Glazier opened to 175,000 and Greg Ostrander called from the big blind. Both players checked the flop and turn. However, Ostrander led out for 200,000 on the river and Glazier made the call. Ostrander flipped over for queens and sixes and Glazier mucked. Ostrander is back up to 3,350,000 after that one. Jackie Glazier called from the button and Greg Ostrander checked his option from the big blind. When the fell on the turn, Ostrander led out for 150,000 and Glazier called. The completed the board and Ostrander fired 350,000 into the middle. Glazier then raised to 1 million even and Ostrander folded - conceding the pot to Glazier, who is now up to 9,690,000. Greg Ostrander opened to 165,000 and Jackie Glazier made the call. The flop came and Glazier led out for 250,000. Ostrander folded and Glazier scooped the pot. Jackie Glazier opened to 175,000 and Greg Ostrander made the call from the big blind. Both players checked the flop and the turn brought a . This time, Ostrander led out for 150,000 and Glazier called. The completed the board and Ostrander fired again - this time for 450,000. Glazier gave up her hand and Ostrander scooped the pot. Greg Ostrander opened to 160,000 and Jackie Glazier made the call to see a flop, which came . Glazier checked to Ostrander, who bet 225,000. Glazier then check-raised to 500,000 and Ostrander four-bet to 1,525,000. Undeterred, Glazier moved all in. "Wow," Ostrander kept muttering to himself, clearly at odds-end with his decision. After tanking for some time, Ostrander slid his hand into the muck. Ostrander later told Glazier that he mucked two red queens. Greg Ostrander opened to 95,000 and action was on Jackie Glazier, who three-bet to 405,000 from the big blind. Ostrander made the call to see a flop, which came . Glazier continued her aggression and fired 525,000 into the middle. Ostrander gave it up and Glazier scooped the pot. Jackie Glazier opened to 190,000 from the button and Ostrander made the call. Both player checked again the on turn, however, Ostrander would lead out for 300,000 on the river and Glazier called. Ostrander flipped over and Glazier mucked. Our final two combatants have resumed play. Lets crown us a champion! Our final two players are on a short break before resuming heads-up play. Jackie Glazier will enter battle with 7,495,000 million versus the 5,055,000 of Greg Ostrander. Jackie Glazier opened to 170,000 from the small blind and Paul Vas Nunes three-bet to 475,000 from the big blind. Glazier moved all in and Vas Nunes called to put himself at risk. The flop gave Glazier a flush draw and sure enough, a landed on the turn - sending Glazier's rail into a frenzy. A meaningless landed on the river and Glazier sent Vas Nunes to the rail with a flush. It was folded over to Paul Vas Nunes in the small blind, who opened to 205,000. Greg Ostrander three-bet to 560,000 and Vas Nunes moved all in for his last 1,925,000. Ostrander made the call to put Vas Nunes at risk. The flop came and before the turn was dealt, a member of Ostrander's rail called for a three, which would be of no help to Ostrander. Some other members of the rail laughed at the comment and Ostrander sarcastically said, "I've got the best rail here!" Amusingly did come on the turn, but kept Ostrander behind. The river sealed the deal and Vas Nunes doubled through to 3,880,000. Ostrander is down to 4,850,000. Greg Ostrander raised to 150,000 and found one caller in Paul Vas Nunes. Both player proceeded to check down the flop, turn and river. Vas Nunes tabled and Ostrander mucked. Vas Nunes chipped up to 2.6 million and Ostrander slipped to 6.8 million. Paul Vas Nunes opened to 130,000 from the button and Greg Ostrander three-bet to 375,000 from the small blind. Jackie Glazier folded the big and Ostrander made the call. The fell on the turn and Ostrander checked again. Vas Nunes would check no more and fired 350,000 into the middle. Ostrander called and the river brought the . Both players again checked. Ostrander tabled for jacks and nines and Vas Nunes mucked without showing. Ostrander is up to 7.2 million while Vas Nunes is down to 2.2 million.